This PR removes the URL session delegate precondition check. Users should be able to create Session instances alongside performance monitoring frameworks such as NewRelic that are swizzling our URLSessionDelegate APIs by proxying. 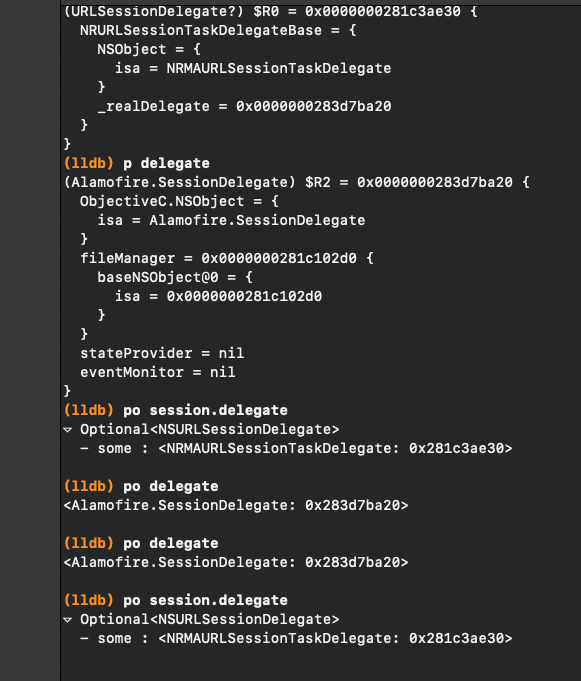 While the session delegate precondition check is a good idea, enforcing the check causes Alamofire to be unusable with other frameworks that are swizzling out URL session delegate APIs. In cases where say Alamofire and NewRelic are being used within the same application, the precondition check will always fail. The above example demonstrates what you get when you po the session.delegate and delegate inside the precondition removed in this PR. The session.delegate is an NRMAURLSessionTaskDelegate (courtesy of NewRelic proxy swizzling) and the delegate is an Alamofire.SessionDelegate. I'm open to other ideas here as well. We could add a flag to disable the precondition that's false by default, but I thought it might be overkill to expose this precondition controls through the public API. As we discussed, there's no good solution here. I'm okay just removing it for now and seeing if it becomes a problem before implement one of the bad workarounds. My 2 year old code started crashing on Alamofire 5. I am using AlamofireObjectMapper "6.0.0" which install Alamofire at "5.0.0-beta.2"